Cabbage is shredded and cooked along with toor dal. Jaggery and tamarind are added for sweetness and sourness. Once cabbage is cooked, finish with freshly fried whole spices. 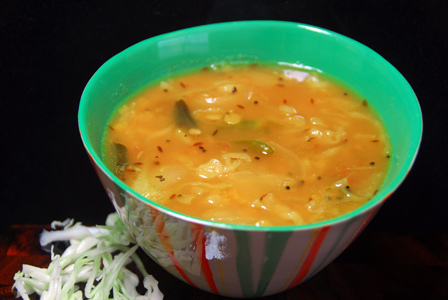 Serve sweet sour cabbage stew with steamed rice and dollop of ghee. Makes: around 6 Servings of Sweet Sour Cabbage Stew. Soak tamarind in a cup of warm water and extract all the juice. Pressure cook toor dal in half a cup of water for 3 whistles. 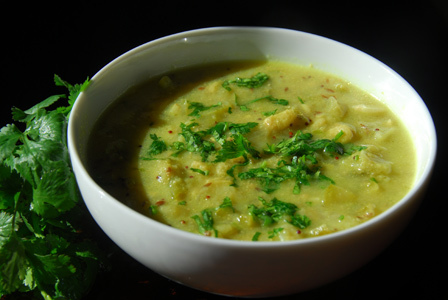 Alternatively, boil toor dal in a sauce pot with 2 cups of water for around 20 minutes or until toor dal is just cooked. Add green chiles, cabbage, onion, fenugreek seeds, tamarind, jaggery, turmeric powder and salt to the sauce pot containing toor dal. Add a cup of water if necessary and boil for around 10 – 12 minutes or until cabbage is cooked. When mustard seeds start spluttering, remove from heat and add to cabbage stew pot. Boil for another minute or two and remove from heat. Serve sweet sour cabbage stew with steamed rice and dollop of ghee. Notes: Make sure cabbage is cooked well before removing from heat. Suggestions: Adjust tamarind and jaggery according to your preference. Variations: You can also thoroughly mash the toor dal before adding cabbage. Other Names: Sweet Sour Cabbage Stew, Cabbage Teepi Pulusu. Onion is diced and cooked in oil along with whole spices. Baby eggplants are stuffed with red chili paste and cooked in the freshly extracted tamarind pulp till the eggplants are soft. Serve easy eggplant stew with plain steamed rice and dollop of ghee. Makes: around 3 Servings of Easy Eggplant Stew. Slit the eggplant making sure its end intact. Make sure eggplants are good and keep them soaking in water until required. Peel and dice the onion into big chunks. Soak tamarind in quarter cup of hot water and extract all the thick pulp. Mix red chili powder, salt and few drops of water into thick paste. Stuff little big of above paste into the each eggplant and keep aside. When mustard seeds start spluttering, add diced onion. When onion turns light golden color, add stuffed eggplants, turmeric powder and salt (if required). Fry for a minute, add the tamarind pulp and jaggery to the eggplants. Cook covered for around 5 minutes or until eggplants are soft. Add more water if required and let the sauce come to a bubble. Once the eggplant is soft, remove from heat. 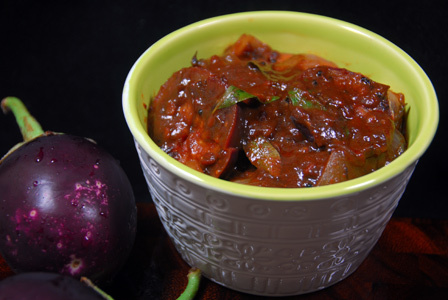 Serve easy eggplant stew with plain steamed rice and dollop of ghee. Notes: Make sure eggplants are cooked properly before removing from heat. Suggestions: If eggplants are not cooked inside, put them back on heat, add few tablespoons of water or more and cook covered on low flame till done. Variations: If using very small brinjals, you don’t have to cut them into half. Use small shallots if possible. Other Names: Easy Eggplant Stew, Noone Vankaya Pulusu. Yellow split moong dal is soaked in water and ground into coarse paste. The mixture is then scooped and deep fried in oil till golden brown in color. The fritters are then added to the tamarind jaggery sauce. Serve moong dal fritters stew with steamed rice and dollop of ghee. Makes: around 4 Servings of Moong Fritters Stew. Soak moong dal in water for 2 – 3 hours. Refresh in water and strain the moong dal. Soak tamarind in half a cup of warm water for sometime and extract all the juice. Stir rice flour in few tablespoons of water to make a paste and keep aside. Grind soaked moong dal and salt into somewhat coarse paste along with red chiles adding small amount of water if required. Remove the ground moong dal mixture onto a mixing bowl, taste and adjust salt if necessary. Scoop small spoon sized moong dal mixture and slowly drop in hot oil. Repeat the same few more times to till the top layer of the oil is filled with fritters. Once the fritters are golden brown on all the sides, remove onto absorbent paper. Repeat the same with remaining moong dal mixture. Break moong dal fritters into halves or quarters depending on the size. When mustard seeds start spluttering, add chopped onion and pinch of salt. Once onion turns translucent, stir in tamarind extract, quarter cup of water, jaggery, red chili powder, turmeric powder and salt. Bring to boil and stir in rice flour paste. Boil for few seconds, remove from heat and stir in slightly broken moong dal fritters. 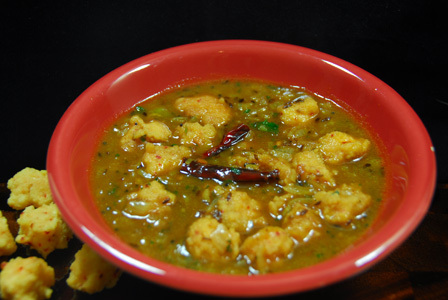 Garnish with cilantro and serve moong dal fritters stew with steamed rice and dollop of ghee. Notes: Make sure moong dal is soaked well. Suggestions: Make sure not to add too much water in the preparing moong dal mixture. Add a tbsp or so of rice flour if moong dal mixture becomes runny. Variations: Add corn flour in place of rice flour to make a paste to thicken the tamarind sauce. Other Names: Moong Dal Fritters Stew, Pesara Pappu Punukulu Pulusu. Sweet potato is peeled and chopped into big chunks. It is then cooked in water along with tamarind, jaggery etc till little soft. Rice flour is mixed with little water to make a smooth paste and added into the sweet potato stew to thicken it. Oil is tempered with spices and added to the sweet potato stew as a final step. sweet potato stew with plain steamed rice and dollop of ghee. Makes: around 4 Servings of Sweet Potato Stew. Wash thoroughly, peel and chop sweet potato into large chunks or half inch thick disks. Heat a sauce pot on high flame, add sweet potato chunks, onion, tamarind extract, jaggery, sliced green chiles, fenugreek seeds, a cup water and salt. Bring the mixture to a heavy boil and reduce the flame to medium. Let the jaggery dissolve and let sweet potato pieces cook thoroughly while still holding their shape (around 20 min). Slowly stir in the prepared rice flour paste into the sweet potato stew to make it little thick. Let the stew bubble for a minute or two before proceeding with next step. When mustard seeds almost stop spluttering, add this to the prepared sweet potato stew. 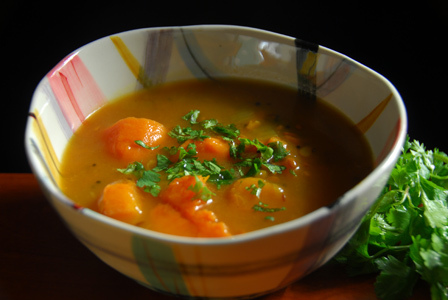 Stir in cilantro and serve sweet potato stew with plain steamed rice and dollop of ghee. Notes: Make sure sweet potato pieces are cooked to the point that they fall apart when lightly pressed. Suggestions: If the sweet potato stew is too sour, add more jaggery. If the sweet potato stew is too sweet, add more tamarind extract to balance the flavors. Variations: Check other recipes with sweet potato here. Other Names: Sweet Potato Stew, Chilakada Dumpa Pulusu.